As a professional trainer and coach I know my subjects well. That’s my problem! It’s too easy to stand up and lecture. The trick is to involve participants in meaningful ways. 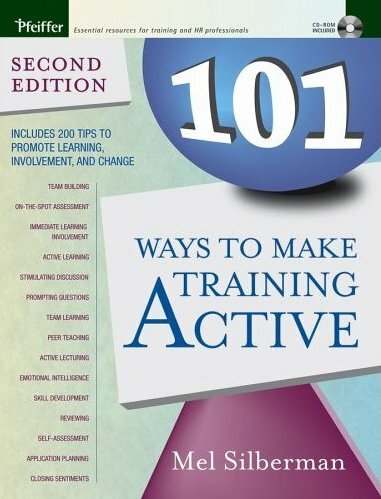 “101 Ways to Make Training Active” is just the ticket. Silberman begins with 20 “top 10” lists of training tips. For example, “Ten assignments to give learning partners” and “Ten suggestions for activating a lecture” and “Ten options for role playing”, etc. Each of the 200 tips are written in brief bullet-point style that stimulates creativity. Every list gave me ideas of how to improve my training – and that’s the point! The bulk of the book, 244 additional pages, are 101 ways to make training active. The activities are grouped together into 15 sections according the flow of a training program: How to Get Active Participation from the Start, How to Teach Information, Skills, and Attitudes Actively, and How to Make Training Unforgettable. I love these ideas! These are some of my favorite. Actively engage participants early on by handing out a “quiz” on the training topic. Have them work individually then compare answers with others. This allows participants to share information, build team work, and engage in the topic. Another idea with similar objectives is “Go to Your Post”. Place 3 or 4 dichotomous choices around the room and ask participants to go the the post they most relate with. Groups at each post discuss why they relate to that choice, or characteristics of that choice, or how to use that choice, etc. Groups report back to the main group with their learning. Do you have a lot of information to get across? Try lecture Bingo. Randomly arrange your main speaking points on a 3 x 3 grid, or Bingo card. As you speak, listeners take notes and mark the speaking points until they get a Bingo (3 marked squares in a row). Acknowledge the Bingo and keep going allowing others to Bingo using your speaking points. Sounds chaotic, but it’s fun! Reviewing learning through the use of memorable methods will further increase the impact of learning. Fun, creative, and above all memorable methods of reviewing learning include Jeopardy and Who Wants to be a Millionaire game show reviews. Silverman gives instructions make either activity easy to create and to lead. I’ve seen a lot of books on training games or activities. Most has a couple of “winners” but this one just doesn’t quit. Buy it, use it, and watch participation, learning, and your course evaluations improve! Question: Have you read this book? You can leave a comment by clicking here.